Midwest Machine Screw, NO 8-32 Screw, 1-1/2 in Length, Round Head, Combo Drive, Fine Thread, Steel, Zinc Plated Midwest Machine Screw, NO 8-32 Screw, 2 in Length, Round Head, Combo Drive, NC Thread, Steel, Zinc Plated Drop forged carbon steel. Designed to grab a single link of chain on the side to form a loop for dragging, pulling or towing. WARNING: NOT TO BE USED FOR OVERHEAD LIFTING. DO NOT EXCEED WORK LOAD LIMIT. DO NOT EXCEED the working load limits for chain or components. DO NOT USE for overhead lifting or hoisting. DO NOT USE if the chain or components are visibly distorted or worn. Warning: Do not exceed the working load limits for chain or components. Do not use for overhead lifting or hoisting. Drop forged construction, zinc plated. Used to easily join attachments to welded chain or wire rope. Drop forged carbon steel. Designed to grab a single link of chain on the side to form a loop for dragging, pulling or towing. WARNING: NOT TO BE USED FOR OVERHEAD LIFTING. DO NOT EXCEED WORK LOAD LIMIT. National Hardware Eye Grab Hook, Removable, Series: 3244BC, 1/4 in Opening, 2600 lb, Forged Steel, Blue, For Industrial and Construction Applications Designed for making quick connections with chain in industrial and construction applications.. Meets Grade 43 hook specifications. Manufactured from forged steel. For use with chain of an equal or lower grade. Not designed for over-head lifting. Designed for making quick connections with chain in industrial and construction applications.. Meets Grade 43 hook specifications. Manufactured from forged steel. For use with chain of an equal or lower grade. Not designed for over-head lifting. Warning: Do not exceed the working load limits for chain or components. Do not use for overhead lifting or hoisting. DO NOT EXCEED the working load limits for chain or components. DO NOT USE for overhead lifting or hoisting. DO NOT USE if the chain or components are visibly distorted or worn. National Hardware Clevis Grab Hook, Removable, Series: 3240BC, 1/4 in Opening, 2600 lb, Forged Steel, Blue, For Industrial and Construction Applications Zinc finish. DO NOT EXCEED the working load limits for chain or components. DO NOT USE for overhead lifting or hoisting. DO NOT USE if the chain or components are visibly distorted or worn. WARNING: DO NOT EXCEED the working load limits for chain or components. DO NOT USE for overhead lifting or hoisting. DO NOT USE if the chain or components are visibly distorted or worn. DO NOT EXCEED the working load limits for chain or components. DO NOT USE for overhead lifting or hoisting. DO NOT USE if the chain or components are visibly distorted or worn. National Hardware Clevis Slip Hook, Series: 3242BC, 1/4 in Opening, 2600 lb, Forged Steel, Blue, Grade 43 Hook Specifications, For Making Quick Connections With Chain in Industrial and Construction Applications Designed for making quick connections with chain in industrial and construction applications. Meets Grade 43 hook specifications. Removable clevis is for easier rigging. Manufactured from forged steel. For use with chain of an equal or lower grade. Not designed for over-head lifting. Zinc finish. DO NOT EXCEED the working load limits for chain or components. DO NOT USE for overhead lifting or hoisting. DO NOT USE if the chain or components are visibly distorted or worn. National Hardware Clevis Grab Hook, Removable, Series: 3240BC, 5/16 in Opening, 3900 lb, Forged Steel, Blue, For Industrial and Construction Applications Designed for making quick connections with chain in industrial and construction applications. Meets Grade 70 hook specifications. Removable clevis is for easier rigging. For use with Grade 70 transport chain or with chain of a lower grade. Manufactured from forged steel. Not designed for over-head lifting. Zinc finish. DO NOT EXCEED the working load limits for chain or components. DO NOT USE for overhead lifting or hoisting. DO NOT USE if the chain or components are visibly distorted or worn. WARNING: DO NOT EXCEED the working load limits for chain or components. DO NOT USE for overhead lifting or hoisting. DO NOT USE if the chain or components are visibly distorted or worn. Designed for making quick connections with chain in industrial and construction applications. Meets Grade 70 hook specifications. Removable clevis is for easier rigging. For use with Grade 70 transport chain or with chain of a lower grade. Manufactured from forged steel. Not designed for over-head lifting. 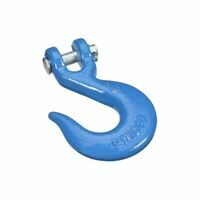 National Hardware Clevis Slip Hook, Series: 3242BC, 3/8 in Opening, 5400 lb, Forged Steel, Blue, Grade 43 Hook Specifications, For Making Quick Connections With Chain in Industrial and Construction Applications No predrilling, screws tap their own threads, secure fastening and striping holding power. Allows for efficient material removal. Applications: Attaching metal lathe to steel studs for stucco/plaster applications, Attaching pre-drilled metal brackets to wood, Applications requiring a wide, low-profile head. No predrilling, screws tap their own threads, secure fastening and striping holding power. Allows for efficient material removal. Applications: Attaching metal lathe to steel studs for stucco/plaster applications, Attaching pre-drilled metal brackets to wood, Applications requiring a wide, low-profile head. Designed for making quick connections with chain in industrial and construction applications. Meets Grade 70 hook specifications. Removable clevis is for easier rigging. For use with Grade 70 transport chain or with chain of a lower grade. Manufactured from forged steel. Not designed for over-head lifting. Designed for making quick connections with chain in industrial and construction applications. Meets Grade 43 hook specifications. Removable clevis is for easier rigging. Manufactured from forged steel. For use with chain of an equal or lower grade. Not designed for over-head lifting. Designed for making quick connections with chain in industrial and construction applications.. Meets Grade 43 hook specifications. Manufactured from forged steel. For use with chain of an equal or lower grade. Not designed for over-head lifting. National Hardware Clevis Slip Hook, Series: 3243BC, 5/16 in Opening, 3900 lb, Forged Steel, Blue, Grade 43 Hook Specifications, For Making Quick Connections With Chain in Industrial and Construction Applications Baron Clevis Grab Hook, 3/8 in Opening, 5400 lb, Forged Alloy Steel, Electro Galvanized Low carbon steel welded chain with longer links than machine chain. Clamshell. Designed for making quick connections with chain in industrial and construction applications. Meets Grade 70 hook specifications. Removable clevis is for easier rigging. For use with Grade 70 transport chain or with chain of a lower grade. Manufactured from forged steel. Not designed for over-head lifting. Designed for making quick connections with chain in industrial and construction applications.. Meets Grade 43 hook specifications. Manufactured from forged steel. For use with chain of an equal or lower grade. Not designed for over-head lifting. Lightweght steel decorative chain for light duty applications. Clamshell,. National Hardware Clevis Slip Hook, Series: 3243BC, 3/8 in Opening, 5400 lb, Forged Steel, Blue, Grade 43 Hook Specifications, For Making Quick Connections With Chain in Industrial and Construction Applications Designed for making quick connections with chain in industrial and construction applications. Meets Grade 70 hook specifications. Removable clevis is for easier rigging. For use with Grade 70 transport chain or with chain of a lower grade. Manufactured from forged steel. Not designed for over-head lifting. Designed to be used with Grade 43 or Grade 30 Chain. Heat treated pins. Hooks are heat treated and tempered. Hooks embossed with chain grade, fractional size, and country of origin. Hooks embossed with trace code providing traceability through manufacturing and testing process to heat of steel. Design ultimate strength equals 3 times working load limit, matching NACM specifications. Grab hooks are designed to grab a single link of chain on the side to form a loop for dragging, pulling or towing. WARNING: DO NOT EXCEED the working load limits for chain or components. DO NOT USE for overhead lifting or hoisting. DO NOT USE if the chain or components are visibly distorted or worn. WARNING: DO NOT EXCEED the working load limits for chain or components. DO NOT USE for overhead lifting or hoisting. DO NOT USE if the chain or components are visibly distorted or worn. Midwest Hex Nut, 1/4-20 Thread, NC Thread, Stainless Steel Provides secure metal-to-metal fastening with strong holding power. Feature sharp points and can be used where a wide, low-profile screw head is needed. Provides secure metal-to-metal fastening with strong holding power. Feature sharp points and can be used where a wide, low-profile screw head is needed. Midwest Hex Nut, 5/8-11 Thread, Hot Dip Galvanized Designed for making quick connections with chain in industrial and construction applications. Meets Grade 43 hook specifications. Removable clevis is for easier rigging. Manufactured from forged steel. For use with chain of an equal or lower grade. Not designed for over-head lifting. Midwest Hex Nut, 3/8-16 Thread, NC Thread, Hot Dip Galvanized Midwest Hex Nut, 1/2-13 Thread, NC Thread, Hot Dip Galvanized Provides secure metal-to-metal fastening with strong holding power. Feature sharp points and can be used where a wide, low-profile screw head is needed. Use for hanging plants and lamps, drapery tie-backs. WARNING: Do not use for overhead lifting. Use for hanging plants and lamps, drapery tie-backs. WARNING: Do not use for overhead lifting. Use for hanging plants and lamps, drapery tie-backs. WARNING: Do not use for overhead lifting. Use for hanging plants and lamps, drapery tie-backs. WARNING: Do not use for overhead lifting. Midwest Wing Nut, 3/8-16 Thread, Zinc Plated Use for hanging plants and lamps, drapery tie-backs. WARNING: Do not use for overhead lifting. Use for tailgates barrier guards, animal ties. Low carbon steel; not heat treated. WARNING: DO NOT EXCEED the working load limits for chain or components. DO NOT USE for overhead lifting or hoisting. DO NOT USE if the chain or components are visibly distorted or worn. Campbell Twist Chain, NO 200 Chain, 48 ft Length, 12 lb Load Capacity, 0.79 in Material Diameter, 0.4 in Inner Length, 0.16 in Inner Width, Brass Plated Ideal for sprocket wheel, overhead door chains, general utility use. WARNING: DO NOT EXCEED the working load limits for chain or components. DO NOT USE for overhead lifting or hoisting. DO NOT USE if the chain or components are visibly distorted or worn. Used for decorative and hobby/craft applications Hobby and Craft clock chain. WARNING: DO NOT EXCEED the working load limits for chain or components. DO NOT USE for overhead lifting or hoisting. DO NOT USE if the chain or components are visibly distorted or worn. Hobby and Craft clock chain. WARNING: DO NOT EXCEED the working load limits for chain or components. DO NOT USE for overhead lifting or hoisting. DO NOT USE if the chain or components are visibly distorted or worn. Campbell Twist Chain, NO 90 Chain, 82 ft Length, 5 lb Load Capacity, 0.056 in Material Diameter, 0.21 in Inner Length, 0.12 in Inner Width, Nickel Plated For general utility, farm and animal applications. WARNING: DO NOT EXCEED the working load limits for chain or components. DO NOT USE for overhead lifting or hoisting. DO NOT USE if the chain or components are visibly distorted or worn. For general utility, farm and animal uses. Proof-tested. Refillable reels sized to fit Campbell merchandisers. WARNING: DO NOT EXCEED the working load limits for chain or components. DO NOT USE for overhead lifting or hoisting. DO NOT USE if the chain or components are visibly distorted or worn. Use for tailgates barrier guards, animal ties. Low carbon steel; not heat treated. WARNING: DO NOT EXCEED the working load limits for chain or components. DO NOT USE for overhead lifting or hoisting. DO NOT USE if the chain or components are visibly distorted or worn. Counter-balance chain for double hung window sashes; also for arc lamp chain, animal chain. WARNING: DO NOT EXCEED the working load limits for chain or components. DO NOT USE for overhead lifting or hoisting. DO NOT USE if the chain or components are visibly distorted or worn. WARNING: DO NOT EXCEED the working load limits for chain or components. DO NOT USE for overhead lifting or hoisting. DO NOT USE if the chain or components are visibly distorted or worn. Use for tailgates barrier guards, animal ties. Low carbon steel; not heat treated. WARNING: DO NOT EXCEED the working load limits for chain or components. DO NOT USE for overhead lifting or hoisting. DO NOT USE if the chain or components are visibly distorted or worn. For hanging fixtures and plants, animal ties. WARNING: DO NOT EXCEED the working load limits for chain or components. DO NOT USE for overhead lifting or hoisting. DO NOT USE if the chain or components are visibly distorted or worn. Use for tailgates barrier guards, animal ties. Low carbon steel; not heat treated. WARNING: DO NOT EXCEED the working load limits for chain or components. DO NOT USE for overhead lifting or hoisting. DO NOT USE if the chain or components are visibly distorted or worn. For general utility, farm and animal applications. WARNING: DO NOT EXCEED the working load limits for chain or components. DO NOT USE for overhead lifting or hoisting. DO NOT USE if the chain or components are visibly distorted or worn. Use for tailgates barrier guards, animal ties. Low carbon steel; not heat treated. WARNING: DO NOT EXCEED the working load limits for chain or components. DO NOT USE for overhead lifting or hoisting. DO NOT USE if the chain or components are visibly distorted or worn. Uses: Marine applications, wherever non-nagnetic, electrically welded corrosion resistant chain is needed. Bright finish. Use for tailgates barrier guards, animal ties. Low carbon steel; not heat treated. WARNING: DO NOT EXCEED the working load limits for chain or components. DO NOT USE for overhead lifting or hoisting. DO NOT USE if the chain or components are visibly distorted or worn.